Parliamentary Images Online went live in Dec 2007 for client TSO. This project was all about getting images from the Parliamentary collection online. "As well as that, we've put in place a full image library system that can grow and be used in all sorts of ways in the future," said Michael Selway of System Simulation. "It's all about bringing coherence to the management of digital imagery across the whole range of departments in Parliament," said Michael. System Simulation worked with the Parliamentary web team, and there were also links with the House education team and the Parliamentary Archive, which is based in the Lords. 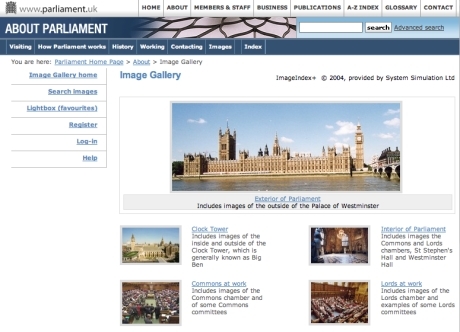 The use of ImageIndex+ allowed the Parliamentary web team to maintain content, to put new images up, and to pull together sets of images on the homepage. ImageIndex+ comes with built-in picture research client software, which works in Windows, and also powers the website with its Lightbox facility, all re-skinned in the correct Parliamentary website look and feel.